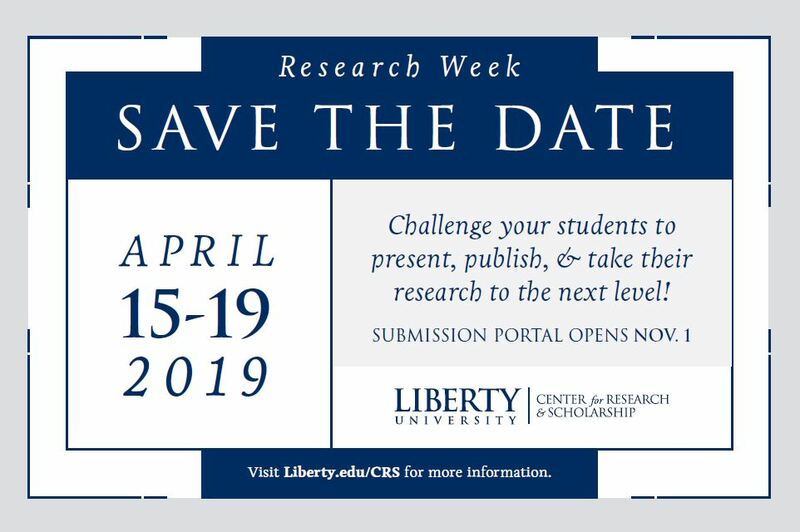 Research Week 2018 is a multidisciplinary annual event sponsored by the Graduate School, the Center for Research and Scholarship, and the Jerry Falwell Library. This event is designed to highlight excellent research and scholarship produced by Liberty University students. Award Winners: presentations were judged by 25 volunteer faculty judges. The event was held in the Jerry Falwell Library and School of Music Concert Hall. The keynote speech was given by Dr. Todd Zakrajsek who is an Associate Professor and Associate Director of the Faculty Development Fellowship in the UNC School of Medicine. Print poster presentations must conform to these templates and guidelines for graduate students and undergraduates. Please follow the templates provided. Please choose landscape orientation or portrait orientation. templates. Students must be physically present to compete. Please be prepared to select one of the following five research subtypes when submitting your proposals: Basic, Applied, Textual or Investigative, or Creative and Artistic (descriptions below). PowerPoint presentations must be created following these guidelines and using any of the 16x9 PowerPoint background slides. Presentations should be limited to 15 minutes with an additional 5 minutes for questions and answers. Please be prepared to select one of the following five research subtypes when submitting your proposals: Basic, Applied, Textual or Investigative, or Creative and Artistic (descriptions below). Remote presenters must have access to these technological requirements . PowerPoint presentations must be created following these guidelines and using any of these 16x9 PowerPoint background slides. Presentations should be limited to 15 minutes with an additional 5 minutes for questions and answers. Please be prepared to select one of the following five research subtypes when submitting your proposals: Basic, Applied, Textual or Investigative, or Creative and Artistic (descriptions below). A music performance, theatre performance, or film. The music performance may be an existing composition or a new composition. The theatre performance may be based on an existing script or a new script. The film must be a new original film. The performance or film may be up to 15 minutes in length, with 5 additional minutes for questions. All presentations must follow these guidelines. All presentations will be judged based on the Performing Arts Rubric. An 80,000 word Ph.D. thesis would take 9 hours to present. Your time limit... 3 minutes. The Three Minute Thesis (3MT® ) is an academic research communication competition developed by The University of Queensland (UQ), Australia. This will be an opportunity for doctoral and master’s level students to concisely summarize and clearly communicate a well-conceived thesis/dissertation project, compelling data collected, and a novel story to share. The ability to do this in three minutes or less allows the student to develop academic, presentation and research communication skills. The rules and judging criteria that the judges will be using can be found here. Students must be near to or already completing a thesis or dissertation. They must also be physically present to compete. Submissions will be accepted for oral and poster presentations based on the following five research subtypes (descriptions provided), and will be judged based on corresponding rubrics. Research in this area seeks to identify and develop a fundamental research question regarding the nature of one’s field of study (e.g., human behavior or genetic manipulations of E coli). These studies successfully experiment with one or more manipulated variables, then analyze the collected information to answer the research question. Typically, these studies will employ the experimental method and are often conducted in a controlled, laboratory environment. Applied research studies aim to better understand or solve real world problems. They employ quantitative, qualitative, or mixed research designs to answer a research question. These studies often utilize quasi-experimental, correlational, qualitative, or case study research designs and will lead to implications for practical application. Theoretical research provides a synthesis of guiding theories and extant empirical literature, artifacts, or other evidence to develop new frameworks for future research. Theoretical proposals may include basic, applied, textual or investigative, creative and artistic research. Research has not been conducted in this category, but suggestions for future areas of research should be included. Research that investigates texts, artifacts, and documents without changing any variables. Typically this research critically engages texts, artifacts, or documents to prove a thesis, association, pattern, relationship, or previously unobserved significance. Sample fields may include History, Philosophy, English, Biblical Studies, Humanities, Theology, Journalism, Law, and Government. Research that discovers and critically evaluates source material in an artistic project for a public audience. Researchers typically work systematically to create new forms of articulation and expression. Sample fields may include Digital Arts, Worship, Music, Cinematic Arts, FACS, Theater, and Communications. Click here watch a video detailing how to prepare a professional poster. Submit and manage your research week submissions through the above link. The deadline to submit your proposals is March 5. The final product (presentation slides, poster template, etc.) is due March 15.